Coffee Makers Reviews Never Talk About This! So, you’ve read all the coffee makers reviews and have bought the best coffee machine for you. Then why aren’t you getting the best tasting coffee possible out of your coffee maker? Why are you getting bitter coffee? Why are you getting weak or watery coffee? If you’ve consulted various coffee maker reviews and have bought a coffee maker with high ratings, then don’t blame it on the machine. You’re probably doing something wrong. Despite the brand, make, model, and features of your coffee maker, its most important facet is the brew basket or filter holder, and how you use it. This is where the most important process takes place --- the coffee extraction process. 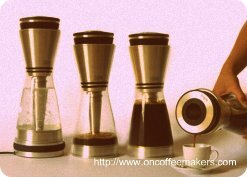 All drip coffee makers use a very simple method of brewing coffee. It involves pouring hot water over ground coffee beans held by a coffee filter. As the hot water seeps through the ground coffee, it extracts and absorbs its oils and essences, which give it flavor and aroma. Under the influence of gravity, it passes through the filter and flows into the coffee cup or pot. As all the liquid has passed through the filter, the used coffee grounds are retained by the coffee filter. No matter how simple the coffee extraction process is, there are a number of things that can go wrong on your end, which will always lead to a disappointing cup of coffee. In fact, only one element in the coffee extraction process is under the complete influence of the coffee maker, which is the water temperature. The best coffee makers heat water up to the optimal brewing temperature before it is used for brewing. If you’ve bought a machine that is rated highly by various coffee maker reviews, then that shouldn’t be a problem. For people who use manual drip coffee makers, the general guideline is to heat up water just below boiling point. Some just simply heat up water to a boil, and then let it sit for a few moments to bring its temperature just below boiling point. Coffee makers reviews never talk about "The Beans"
It all starts with the coffee bean. It is one of the keys to getting a great cup of coffee. You may think that you can get away with just buying a pre-ground can of coffee beans, and produce the best cup of coffee at home, but that isn’t the case. The truth is, to get the best tasting cup of coffee possible; you should buy the best coffee beans that you can afford. Good beans can be bought for a reasonable price at your local grocery store. And you should be buying a batch of whole beans that can only last you for 7 days. Coffee makers reviews never talk about "7 days"
Once coffee has been roasted, it rapidly loses its flavor and aroma. Vacuum packaging and sealing will slow down the deterioration process, but it will still lose its flavor and aroma over time. Once the seal and packaging has been opened, the coffee beans will be exposed to air, and a huge amount of its flavor and aroma will greatly deteriorate in a span of 7 to 10 days. And you don’t want to brew a spoiled batch of coffee beans, no matter how good that batch might have been at some point. Coffee makers reviews never talk about "The Grind"
Now that you’re aware of the importance of getting fresh coffee beans, let’s shift our attention towards another key aspect to getting a great cup of coffee, which is the grind. For freshness’ sake, you should only grind as much coffee as you plan on using for one brewing cycle, since ground coffee beans deteriorate much faster than whole coffee beans. Furthermore, the general guideline when using drip coffee makers is to grind beans to medium coarseness. Coffee beans ground to medium coarseness have the same look and consistency as table salt or unrefined sugar. Coffee makers reviews never talk about "Water"
While the coffee maker influences the brewing temperature of the water, it cannot change the quality of the water, unless it comes equipped with a water filter. 98% of coffee is made up of water; therefore, the quality of the water also determines the quality of the coffee. If you’re using tap water to fill up the water reservoir of your coffee maker, you should look into using filtered water to ensure that your coffee is as flavorful as possible. Coffee makers basically uses gravity to let the water that saturates the coffee ground to drip down for you to get a good cup of coffee. Thus, what seperates a good cup of coffee from a low quality one, are the coffee grounds and the water. No matter how sophisticated your coffee maker is, these two variables have to be good in order for a quality brew. Vietnamese coffee maker offers a different kind of coffee taste that some of us pay to top dollars in restaurants. So, wouldn't it be great if you can replicate this at home? Commercial coffee pot as the name suggest is meant for the commercial sector, thus one of its criteria is to be big. This is to cater to the fast turn around in this sector. Is coffee maker rating important in getting good coffee? Are free coffee makers really free? Built in coffee makers are beautiful, but would you buy them? Cooks Coffee Maker – A Cheap Coffee Maker? Cooks coffee maker has one of the lowest cost coffee machines in the market, but it is known to be one of the more problematic coffee brewers. So, it is worth the price tag that it carries? Many people are aware about the differences between coffee and espresso makers, but what exactly are their differences? Is a coffee maker better than an espresso maker, or vice versa? Why am I getting bitter or weak coffee? Despite reading tons of coffee makers reviews and buying some great coffee maker, some folks are still experiencing bitter or weak coffee, what went wrong? Have A Great Story About Gravity Brewing? Saeco has to be among the best for programmable coffee maker right?